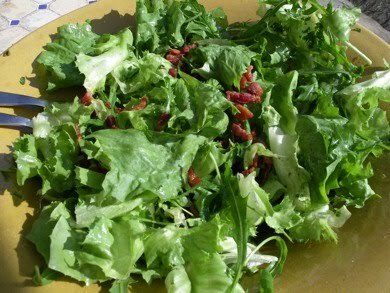 A classic Provencal salad of wild bitter greens with fried bacon pieces. This salad is the exception to the rule in that vinegar is put onto the leaves before oil. Wash the the leaves well, remove any bad bits and tear into bite size pieces. Arrange the pieces in a large bowl. Put the oil and bacon in a frying pan and fry until crisp. Meanwhile sprinkle the leaves with vinegar, salt, pepper and parsley and toss well. When the bacon is ready pour over the salad oil and all. Give it a good toss before serving with chunks of fresh bread. Gardeners Note The greens for this dish were traditionally wild leaves such as dandelion, burnet, wild chicories and any other herbs to be found in spring. You can use any other variety of endive or chicory, frisee is particularly good, rocket, lettuces and herbs. When Rachel visited her 80 year old Aunt, Marie Camino, in Spain she came home singing the praises of her cooking and reminiscing on the wonders of her aunts food. This dish in particular stood out and for me too because not only is it delicious but it is also a Spanish version of my favourite English breakfast of Bacon, eggs and tomato. I find it fascinating that people in different parts of the world combine the same ingredients yet create such different dishes with them. It is wonderfully simple and makes a great add hoc snack, breakfast, lunch or dinner. Fry the ham in olive oil for a few seconds with a little crushed garlic if using, pour over fresh tomato paste (passata) and cook for a minute or two before breaking an egg on top. Cook until the egg has poached and set in the tomato sauce, sprinkle with capers if you like them and serve with slices of bread. Cooks Note use any dry cured ham for this dish I’ve tried Spanish, Italian and French hams all good, but I do prefer Spanish ham so we always stock up on our visits across the border. Paella gets its name from the pan it is cooked in, a paellera a large shallow pan with two handles, originally intended for outside cooking over a hot, wood fire. It’s origins are Arabic though it is most commonly associated with Spain and South Western France. Paella was a poor man’s fare and so a little of everything on hand went into it, making it a perfect dish for vegetable gardeners. 500g – 1kg combination of vegetables, fish and/or meat. First prepare the stock and infuse a good pinch of saffron in the hot stock. Next set the paella pan or large frying pan on the heat and add half the oil. Fry the meat until browned then remove and set aside. Add remaining oil and fry the onion and peppers until very soft, add garlic until the aroma rises, then add thymn, paprika, salt and any other vegetables and fry for a few minutes. Return the meat to the pan and add the rice stir well to coat in oil. Then add the stock and give it a good stir. From this point on DO NOT STIR the dish again. Simmer for 10mins then push the seafood into the rice, if using, and continue cooking for another 10mins or until the rice is almost done and most of the liquid has evaporated. 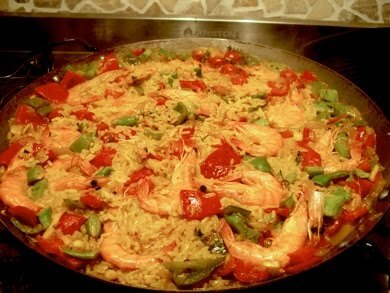 Remove the Paella from the heat, cover with foil or a large plate and leave to sit for 10 minutes more before serving. Garnish with parsley and serve. Paella is made all over Spain and each region contributes to its own variation. Paella Andalucia is the most commonly known paella and generally has prawns, mussels, clams, chicken or rabbit, a little pork and sometimes sausage, and usually no green beans. Paella Valenciana has chicken or rabbit, a little broad green bean, white beans and snails. 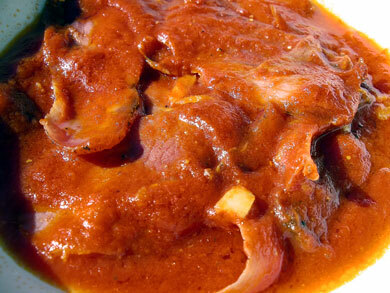 Catalonia’s speciality is Paella Parellada a rich man’s version because the bones and shells are removed. You can create your own variations depending upon the season and what you have available. 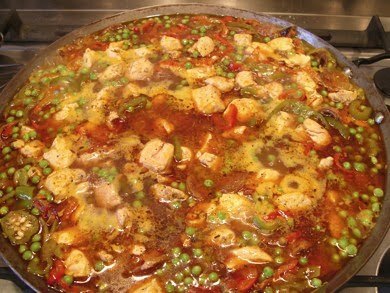 The paella shown cooking here is made with chicken breast, peas, peppers and tomatoes. Meat: Pork. Chicken, rabbit, Spanish chorizo sausage, meat should be cut through the bone because the marrow will give it more flavour. A chicken leg for example will typically be cut in two or three pieces. Seafood: prawns, clams, mussels, squid, fish, languostine. Liquid a good broth or freshly made stock infused with saffron white wine, light spanish sherry. The best paella is only about 2cm deep and has a little golden crust on the bottom. This takes practice! A good paella is done when the rice is still firm, and all the rich, wonderful juice has been absorbed this will take about 20 minutes. Its consistency should be moist, not creamy like an Italian risotto or dry with separate kernels like a pilau.